China, representing one of the earliest civilizations in the world, has a recorded history of about 3,600 years. 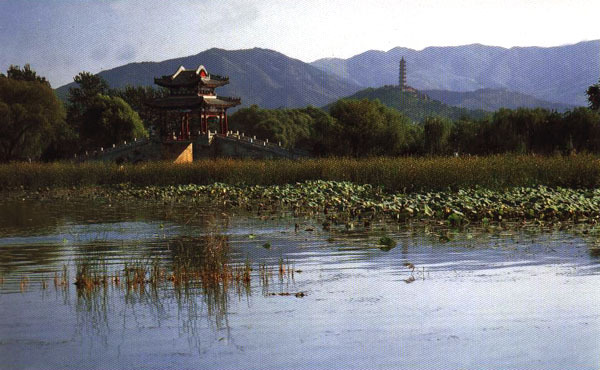 Yi He Yuan (The Summer Palace) is located in the northwest suburb of Beijing. It has a total area of 290 ha., over three quarters of which are water. The Summer Palace used to serve as a summer resort for the royal family in the Qing Dynasty. The park comprises Lake Kunming and Longevity Hill. A covered walkway, 728 meters long, runs along the northern side of the lake and is famous for the historical paintings decorated on its beams. This walkway is known as long corridor. At its end, there is the famous Marble Boat built by Ci Xi (the Empress Dowager) when she rebuilt the entire area with navy funds.